SUBHEAD: International Union for Conservation of Nature is on the wrong side of both issues. 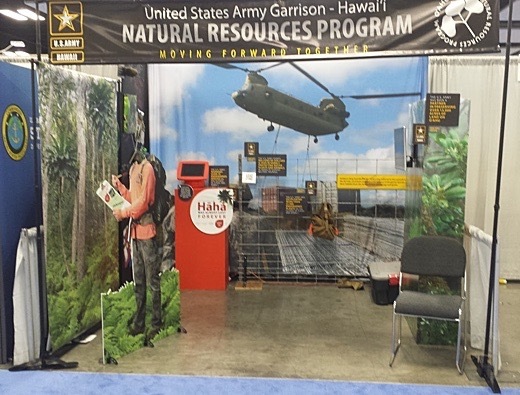 Image above: Booth of the US Army at the IUCN World Conservation Congress held in Honolulu Hawaii. From original article. The IUCN World Conservation Congress held most of its meetings at the Hawaii Convention Center. 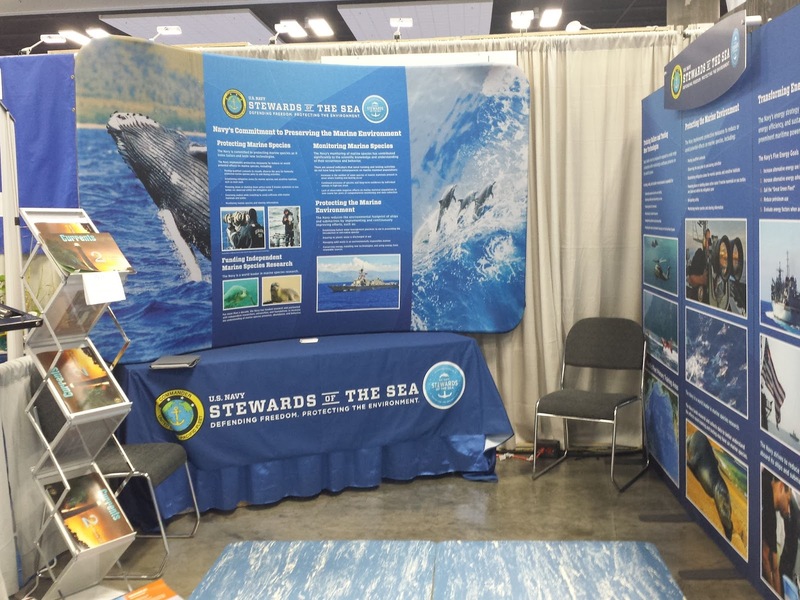 The first floor was devoted to booths and displays by both IUCN members and non-members. The U.S. Army, Navy, and Air Force had side-by-side booths. 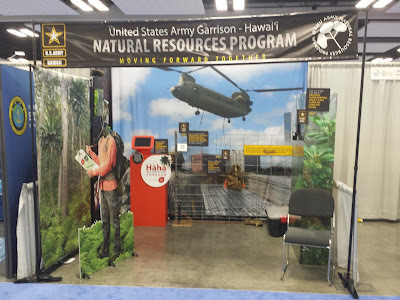 I asked one representative of the military if they were members of the IUCN. She remarked that the military had contemplated it, but they had missed the deadline to be a part of the World Conservation Congress. Nearby was the booth for the National Whistleblowers Association. 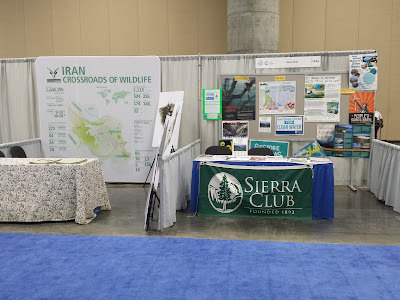 The Sierra Club booth was located next to an Iranian booth. The Iranian Department of Environment lists 1,140 animal species in Iran, including mammals, birds, reptiles, amphibians and fish living in internal lakes as well as surrounding seas, and that 74 of these species are on the International Union for Conservation of Nature Threatened Species Red List. There were several large booths with cardboard tables and cardboard chairs and a series of presentations and panel discussions. Many of the attendees asserted that attending the Congress was very worthwhile; that many of the speakers and panels were quite engaging. Among all the glitter, the self-promotion, the accounting of recent successful endeavors, and of the hard road ahead, there were signs of tectonic splits and shifts. The Congress voted to establish a new membership category for like-minded indigenous non-governmental organizations. This occurred in the 69th year of the organization, after it had been battered for promoting protected ecosystems through the removal of their indigenous communities. The Congress seemed to overlook military and governmental transgressions, and instead focus on working with governments and big business to advance conservation efforts. Chad Blair wrote in Civil Beat: The Military Tries To Sell Itself As Positive Environmental Force. 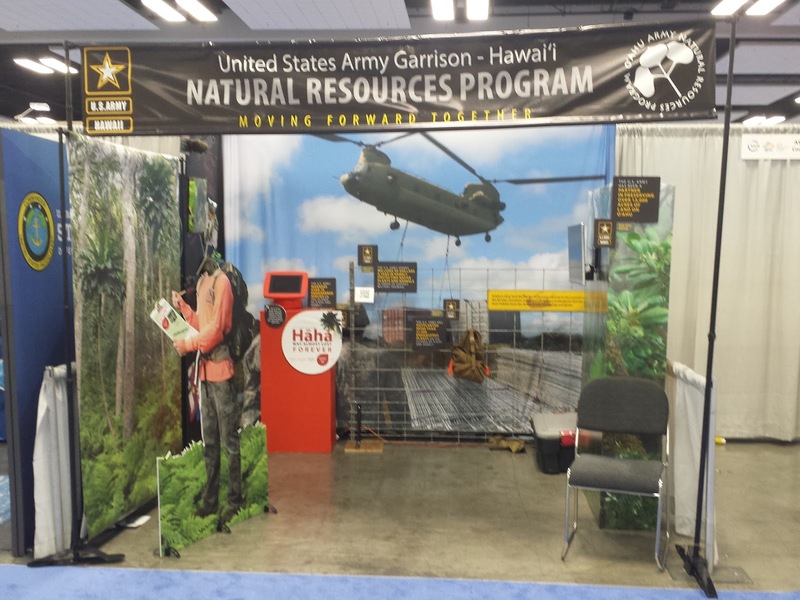 "The U.S. Army, Navy and Marines made a pitch to conservationists from around the world that they share the same goals. Not everyone is buying it." One of the splits is between correctly pricing the value of nature through ecosystem services, versus, accepting that people are part of the biotic community and not its overseer. The former view is common to many but not all at the IUCN. The latter was well captured in a 15-minute YouTube presentation by Tom Butler, the editorial projects director of the Foundation for Deep Ecology and the volunteer board president of the Northeast Wilderness Trust. Another controversy is the close ties IUCN has with major polluters. In 2010 IUCN and Shell hired Stephen Turner to write a report about their collaborative efforts. Nnimmo Bassey is a Nigerian architect, environmentalist activist, author and poet, who chaired Friends of the Earth International from 2008 through 2012. He was one of Time magazine's Heroes of the Environment in 2009. In 2010, Nnimmo Bassey was named co-winner of the Right Livelihood Award, and in 2012 he was awarded the Rafto Prize. He serves on the Advisory Board and is Director of the Health of Mother Earth Foundation, an environmental think tank and advocacy organization. Richard Steiner is a professor and conservation biologist. SUBHEAD: Proliferation of military bases and their effects on the environment and local and indigenous life. 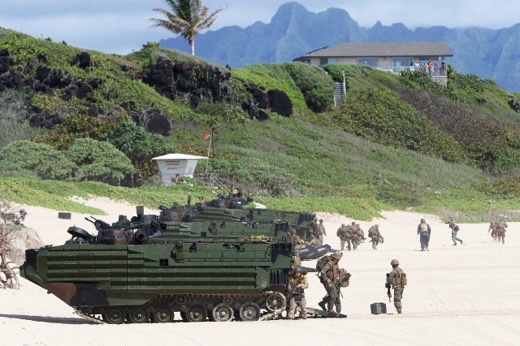 Image above: U.S. Marines Amphibious Assault Vehicles rolls onto the sands at Pyramid Rock, Marine Corps Base Hawaii in Kaneohe, during RIMPAC exercises last summer. From original article. 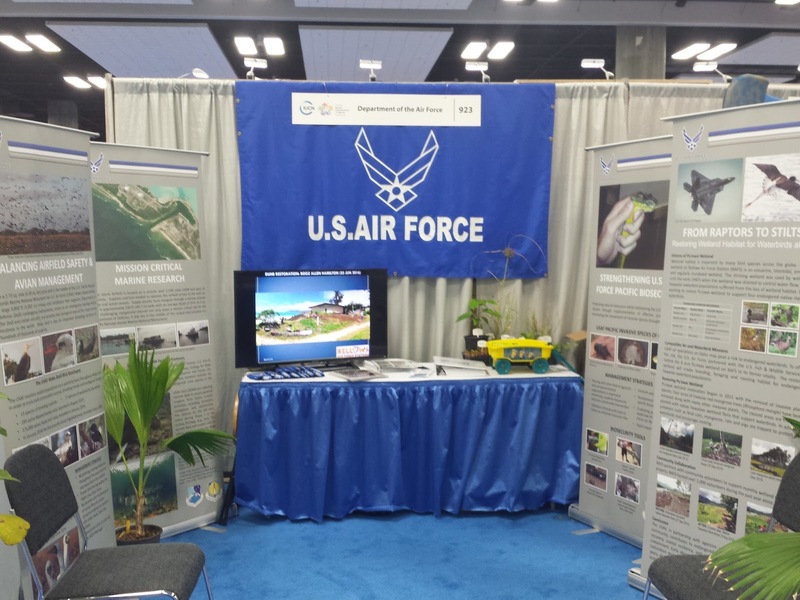 Where Is The Concern Over Military’s Environmental Impact? Despite the threats military activities pose to the natural world, surprisingly few panel discussions at IUCN broached the subject. A week ago, a group of 15-20 activists and students gathered on the University of Hawaii Manoa campus to share the remarkably similar and interconnected stories of nations and peoples from around the Pacific that are struggling against the environmental destruction and limitations on sovereignty caused by the U.S. military and U.S. interests. There were seasoned demilitarization and aloha aina activists from Hawaii in attendance who spoke about the desecration of iwi kupuna to build Marine Corps base at Kaneohe, as well as activists concerned with the proliferation of military bases and their effects on the environment and local and indigenous life in Guahan (Guam), South Korea (notably on Jeju Island) and the Philippines. Also discussed were the legacies of French and U.S. nuclear testing in Tahiti and Micronesia. Sometimes it’s a foreign military that does the dirty work for U.S. interests. We spoke about the violence and repression going on in West Papua as the Indonesian government makes sure that the Grasberg mine — one of the largest gold mines in the world — continues to run for the benefit of its owner, Arizona-based Freeport-McMoRan. What spurred this meeting was the visit of several activists from Okinawa who are struggling against the building of a new U.S. air base at Henoko Bay, the latest in a long history of adverse effects on Okinawa from the presence of military bases. These Okinawan activists were here to take part in the World Conservation Congress but also headlined in a panel talk on Okinawa attended by over 70 at Kamakakuokalani Center for Hawaiian Studies on Thursday night. One general theme is that truly protecting our environment means paying attention to the effects of militarization and war on the land, indigenous peoples and local autonomy in Pacific Islands. After all, it is well known that modern war is ecologically devastating and releases hundreds of thousands of tons of pollutants and greenhouse gasses into the atmosphere. Closer to home, we know from the examples of Kahoolawe, Pohakuloa, Makua Valley, Puuloa (Pearl Harbor, which once boasted the most fishponds on Oahu) and many other sites that it is indigenous land and peoples and local people who pay the unspoken costs of housing the U.S. military. Yet, a quick search of all 1,349 items in the IUCN World Conservation Congress’ online program for the keyword “military activities” yields nine results. Furthermore, the celebrated Papahanaumokuakea Marine National Monument puts no limitations on the U.S. military. The proclamation that President Barack Obama signed to expand the monument states, “The prohibitions required by this proclamation shall not apply to activities and exercises of the U.S. Armed Forces, including those carried out by the United States Coast Guard.” It goes on to state that nothing in the proclamation will limit the U.S. military’s ability to use property under their control or limit the availability of property for their use. In other instances around the world, such caveats allow for paradoxical situations around the Pacific and in other oceans where conservation areas actually house or provide a buffer for military bases. I participated in last week’s talk story and sign-making event as a student wanting to learn more from folks on the front lines of demilitarization and environmental struggles. One thing that became apparent is that in the Pacific, as in the world, we are all connected, and our efforts at protecting the environment need to first acknowledge and then foster our interconnectedness. As Peter Apo has noted, the Western model of protecting the land, called conservation, depends on drawing an imaginary line around an area in order to “preserve” it. Too often such approaches sever the connections between indigenous peoples and their land while leaving unquestioned the logic that puts military objectives high above environmental concerns and regulations. Under conservation models, the rest of us are also cut off from ever forming a real, respectful and responsible connection with land; what we get instead are touristic models where we conspicuously consume “outdoorsy” experiences and products that may still be environmentally harmful. Conservation models, by setting aside only some land or ocean to protect, also make us feel like it’s OK to destroy other islands, lands and ecosystems when it’s convenient or “necessary.” But it’s not OK. #OurIslandsAreSacred and what goes on in one part of this vast ocean surely affects all other parts of it. There will surely be positive effects on marine life from setting aside such a large tract of ocean and taking pressure off of over-fished species. And I’m glad that concern for the environment has gone mainstream. But I am even more hopeful about the international coalition of activists, scholars, and advocates that is drawing connections between struggles and pointing in the direction of where more work has to be done. • Kelsey Amos is a graduate student and graduate assistant at the University of Hawaii at Manoa. She is also a writer/coordinator for the Purple Maia Foundation, which provides "access to empowering technology education for underserved youth in Hawaii." SUBHEAD: Indigenous peoples’ lands and territories coincide with areas that hold 80% of the planet's biodiversity. The International Union for Conservation of Nature (IUCN) has a reputation of collaborating with governments, and more recently, with large multinational corporations. Of placing nature above people. Thus IUCN supported re-locating native people out of areas that become protected areas. Sierra Club has been a member since 1956. 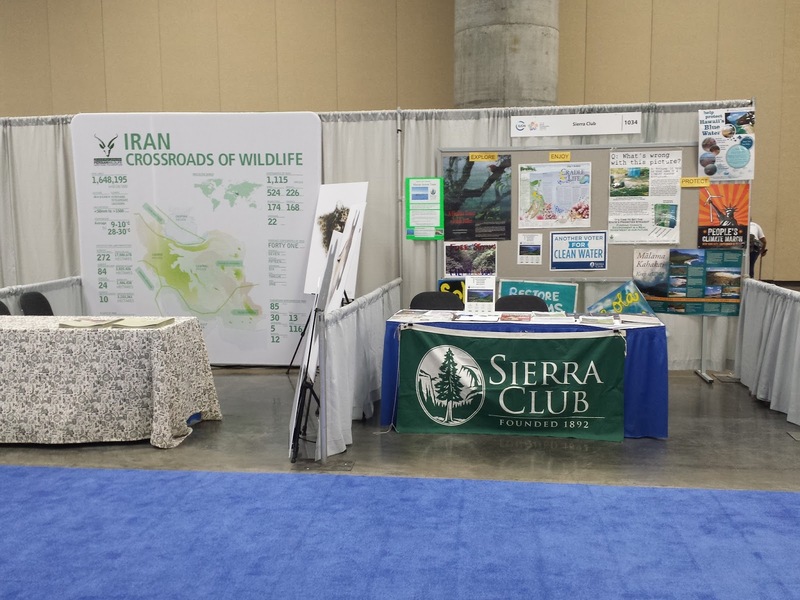 Representing the Club at the IUCN was Richard Leonard in the l950s and David Brower in the l960s. NRDC has been a member since 1975. Two University of Hawaii units are members: Lyon Arboretum and the Richardson School of Law's Environmental Law Program (ELP). Hawaii Pacific University and the Conservation Council for Hawaii are members. Over the past decades, IUCN resolutions have been approved regarding high-level military issues such as armed conflicts, chemical weapons, anti-personnel weapons, and cluster weapons, but generally not specifying opposition to specific conflicts. The Honolulu Star-Advertiser published a Viewpoint on September 8, 2016, written by Koohan Paik, a Hawaii island resident and project director of the Asia-Pacific program at the International Forum on Globalization; Nelson Ho, a Hawaii island environmental activist; and Tom Luebben, a Native American rights and environmental attorney. International Union for the Conservation on Nature (IUCN) is entrenching itself in a greenwashing tradition forged eight years ago at the 2008 WCC in Barcelona. Then, the scientific community was shocked by IUCN`s announcement that it was taking money from Shell Oil. Many members quit IUCN for selling out. Five years later, IUCN and Shell co-authored a report congratulating Shell for its progress in cleaning up the Niger Delta, an area Nigerians say Shell devastated irreversibly. More scientists and members, disgusted, quit after the 2012 WCC. The state Department of Land and Natural Resources has abandoned, bungled or lost the fight with virtually every invasive species, including miconia, coqui frogs and the fire ant. There is expansion, rather than restraint, on transoceanic and interisland agricultural trade that spreads invasive species." A National Host Committee was established in 2014 to support hosting the 2016 IUCN World Conservation Congress in Hawaii. The National Host Committee voting members include officers, executives, and directors of the Hawaii Medical Service Association, National Tropical Botanical Garden, Hawaii Department of Hawaiian Homelands, Hawaii Department of Land & Natural Resources, Green Growth Hawaii, Office of Hawaiian Affairs, Bernice Pauahi Bishop Museum, Hawaii Tourism Authority, Bank of Hawaii, University of Hawaii, Office of the Governor of Hawai`i, and the East-West Center. At the end of August, the Hawaii Independent published a viewpoint signed by a diverse group of organizations and individuals. The open letter to the IUCN World Conservation Congress asked for the Congress “to take clear and immediate action to stop” several controversial projects harming the environment, including the desecration of Sacred Mauna Kea, the Trans Pacific Partnership, the United States Military & RIMPAC war exercises, the proposed Department of Interior (DOI) Rule to create a Native Hawaiian Tribe, and the building of the North Dakota Access Pipeline. The signers included members of Protest Nai Aupuni, Hui Ku Like Kakou, Destination Restoration, KAHEA - The Hawaiian Environmental Alliance, Ka Lahui Hawaii Political Action Committee, ‘Ohana Koa Nuclear Free and Independent Pacific, Mauna Kea Anaina Hou, Kai Palaoa, Nā Koa Ikaika O Ka Lahui Hawaii, and Kai ‘Ula Pono’i Texas HCC. Over the past few years the IUCN has increased regional support and staffing beyond its historic European-US-centric past. The members of the IUCN are electronically voting on, and holding delegate meetings on about 100 resolutions which will guide future IUCN policy. At least ten Resolutions are being voted that deal with indigenous people. Eight have passed and two are pending. IUCN focuses on influencing governments, and the design of international treaties and agreements. Which native people will be allowed to sit at the table, is as important as, permitting any native people to sit at the table in the first place. Resolution 22 focuses on Illegal Wildlife Trade (IWT) occurring in “Indigenous Peoples' and Community Conserved Territories and Areas” (ICCAs). Resolution 29 recognized the extensive overlap between the territories and areas conserved by indigenous peoples and local communities (ICCAs) and that of protective areas. “Many indigenous peoples and local communities care for, self-govern, manage, protect, sustainably use, restore and enrich – in one word ‘conserve’ – all or parts of their territories and areas, including commons, sacred sites, and locally managed marine areas, in ways that meet IUCN definitions of indigenous peoples' and community conserved territories and areas (ICCAs), IUCN and the Convention on Biological Diversity (CBD) definitions of protected areas." Resolution 59 deals with IUCN support for the Paris Climate Accord. The Resolution is pending. Resolution 66 focuses on palm oil. The Resolution is pending. Resolution 71 deals with Community Based Natural Resource Management (CBNRM). Resolution 95 deals with synthetic biology, a multi-disciplinary field which includes biotechnology, evolutionary biology, genetic engineering, molecular biology, and molecular engineering. Resolution 97 focuses on safeguarding indigenous lands.